Nigel Farage, the former Ukip leader who lives in south-east London, announced on Thursday that he’s considering a run for London mayor in 2020. The outspoken Brexit champion said such a move would allow him to “make arguments” on a high profile platform – and he thinks he has enough support to actually pull it off, beating out whichever candidate the Conservatives put forward. 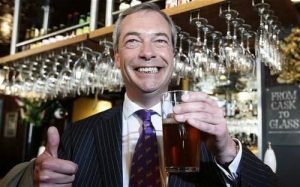 Farage, who left the UK Independence Party in July 2016 – just weeks after the UK voted to leave the EU, will lose his spot in the European Parliament next month when that occurs next March. Despite seven unsuccessful runs for parliament, Farage has been elected an MEP three times. One senior Conservative official told the Financial Times that Downing Street was bracing for electoral embarrassment should Farage throw his hat in the ring. Kahn – the mayor of London for two years, is seen as the frontrunner in the race. Next month, the Tories will pick a challenger from a shortlist of three relatively unknown candidates: London Assembly members Shaun Bailey and Andrew Boff and Ealing councillor Joy Morrissey. One ally of Mr Farage said more Londoners had voted for Brexit than for Mr Khan, despite the city’s pro-EU reputation. Mr Khan became mayor in 2016 on 1.3m first and second preference votes, while in the EU referendum — where turnout was significantly higher — 1.5m Londoners voted Leave and 2.3m voted Remain. “I’d never thought I’d see the day where the murder rate in London would overtake that of New York,” said Kahn. Is the tide turning on Kahn?